MUD covered a section of the Usino Highway in Madang when a Ramu NiCo slurry pipe burst and sprayed its content 10 metres into the air. It burst last Wednesday morning at the Igiruwe area in Usino LLG. The welded pipes linked the Kurumbukari mine facility in Bundi and connected the processing plant at Basamuk refinery in Rai Coast. Ward councillor of the area, Moses Kuruwara, said the pipe was leaking since the previous Sunday and was reported to the Ramu NiCo management last Monday. Jacob Winis, a local from the area, said a woman saw the leakage. Winis said the pressure forced the red mud mixture of nickel and chromite deposits high up in the air and when it rained down, the vegetation around the area was covered in mud. 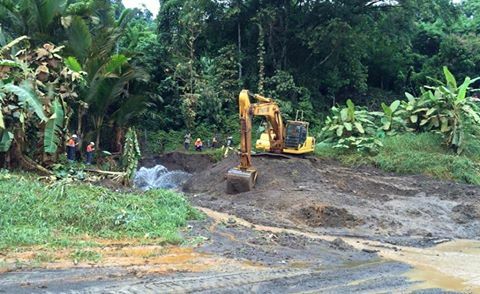 “The banana trees were destroyed, the grass on the side of the road laid flat,” Winis said. The Ramu NiCo management told landowners along its 135 kilo metres slurry pipeline that the slurry at Iguruwe village was not a “disaster”. The company described the leakage “unfortunate” at a challenging operation period and assured the landowners that there was no short and long-term environment impact on their food gardens, animals and human beings. “It is normally present in the environment naturally. “There is no acid in it and we ask people not to mislead the lanowners. It however, urged the public to be careful on how they report the matter. What a stupid thing to say…everything breaks eventually. Look at how many times the OK Tedi line between Tabubil and Kiunga has broken down and no doubt the LNG line will develop a leak at some point in its life. Important that the authorities respond to this and assess objectively to ensure the communities that there is no long term health impact. We cannot predict the accident, but the company should’ve apologized.